Students from Islip's EXCEL program look at a motor they built. Photo courtesy of the Islip School District. George Delagrammatikas, associate professor of mechanical engineering and program director of STEM Outreach, hosted two groups of academically gifted students this spring, one from a middle school in Islip, New York the other from PS85Q in Astoria, Queens. 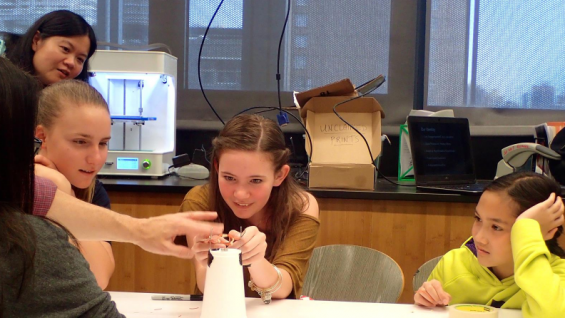 The students took part in a hands-on lesson about circuitry at 41 Cooper Square, on May 20 and June 8. They ran an internal combustion engine, built a small electric motor from scratch and learned to use a laser cutter and a 3-D printer. Prof. Delagrammatikas, who founded and runs the STEM Saturdays program for high school students, believes that the sooner children experience the excitement and challenges of science, the more likely they are to consider STEM careers in the future. "That's particularly important for bringing girls and first-generation Americans into the field," he said. Of the 26 fourth graders from PS85Q who participated, 18 were girls. See Cooper's K-12 STEM outreach page for more information.